Deep green in spring and summer, aflame autumn leaves, and fantastic morning mist on the lake Kinrin, leisurely experience those attractive scenery of Yufu from season to season. We treat guests with a "gentle hospitality" beyond the politeness. In door bath halls and outdoor baths are equipped each on the 1st floor and the 2nd floor. Male/Female designation hours of each bath are altered at the morning and the evening, so that you can experience all baths. The in door baths and the outdoor baths are made with local porcelain stones and big stones, and from those baths you may see the forest which changes from season to season so you will be able to savor the feelings of a forest bath. In the middle of the magnificent spectacles of nature all around at Mt. 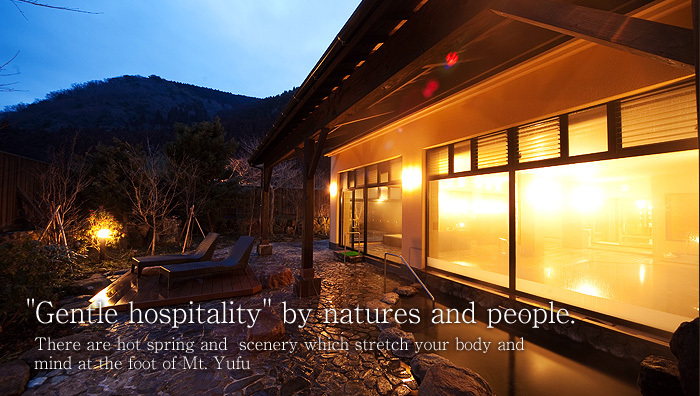 Yufu, you can enjoy 100% running natural hot spring water from the source. An outdoor bath and Sauna are attached. You can relax your body and mind with abundant and quality waters of Yufu.